PrivCoin isn’t a new name when it comes to Bitcoin mixing, and considering how users are getting more and more conscious about their privacy and anonymity on the Blockchain, I believe this PrivCoin review is well placed. PrivCoin is a Bitcoin mixer, a platform which simply takes in user deposits of Bitcoins, and sends different sets of Bitcoins equal to their initial deposit back. Because there’s absolutely no link between the set of Bitcoins sent in and the ones sent out, the ones sent out are called cleaner coins and can be used just about everywhere. Otherwise, ones a user purchases Bitcoins from any source, wherever that money is sent can be traced, tracked and finally linked back to the users real-life identity with enough efforts. What’s unique about PrivCoin is, it lets users send in Bitcoins, and receive equal amounts of funds in other currencies such as ETH, BTCH and LTC as well! This is one of the most effective yet rarest features any mixer in the industry offers. I have this tradition of always scribbling down an overview of whatever it is I’m reviewing, the same holds true for this PrivCoin review as well. 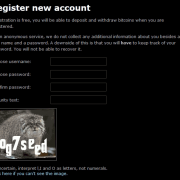 No logs policy: Yes (24-hour Retention period). **PrivCoin doesn’t allow US residents to use the platform, and it reportedly invites govt. authorities from other countries which consider BTC to be illegal or in violation of their country-laws to let the platform know so they can ban people from those countries. User Interface tops my list of priorities in all my reviews for the simple reason that regardless of the features and abilities a platform offers, if it can’t be used or understood easily those features aren’t worth a dime, are they? As soon as users land on the homepage, they’re presented with 4 coins to choose from, namely BTC, ETH, BCH, and LTC. Considering how we’re talking about Bitcoin mixers, obviously, the choice of Bitcoins should be made. In my personal opinion, the green button was a completely unnecessary step which simply consumes more time and doesn’t add any value to the interface, however it doesn’t make the interface any “harder” per say. Down to the main mix-page, it holds a “previous transaction ID” field at the very top which is like the mixing code offered by other Bitcoin mixers, it lets the mixer know if the same customer is back for another mix which helps them prevent themselves from sending out same customer’s earlier coins to them again. Then there’s the output address box which is where users enter the address they wish to receive the clean coins on, just below that is another tab which lets users add another address in case they wish to use multiple output addresses. The fee-slider too is self-explanatory, it lets users increase or decrease the fee by adjusting the slider. And then there’s the time-delay slider, again no rocket-science needed to understand how it functions. 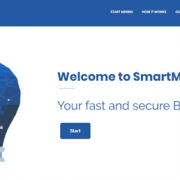 So in a nutshell, the user-interface is pretty easy to understand and the platform can be operated by just about anyone without a lot of hassle, hence I’d rate the UI a 5/5 for the purposes of this PrivCoin review. No, PrivCoin seems to respect user privacy and doesn’t require registration for normal mixes. Users can simply go to the main page, fill in the details and start mixing. It does however have a login portal which is to be used by Investors and Affiliate Managers which is a different story, but registrations aren’t needed to mix Bitcoins. How Many Additional Addresses does PrivCoin Support? Additional Addresses are one of the simplest yet most effective ways to increase Bitcoin privacy. It’s the feature which lets users send their cleaned coins to more than one addresses. It increases anonymity and de-links the unclean coins from the clean ones as when more than one addresses are employed the net amount going in, and the individual, smaller amounts coming out for each additional address are totally different. A real-world example would be, Mr. John sending USD $500 worth of BTC to the cleaner, and if he specified 5 additional addresses, he’d receive random (or sometimes can be controlled by users) amounts such as $100, $200, $50, $50, $100 to each individual address, hence no single transaction would be exactly equal to the set of the unclean coins. As far as PrivCoin is concerned, it supports as many as 10 additional addresses! So each set of unclean coins can be broken down into as many as 10 parts and sent to the addresses. Does PrivCoin allow Time-Delays? Are they User-controlled? Time-delay is another feature which adds to user anonymity, so that there’s some amount of time-gap between the unclean coins going in, and the clean coins coming out. Else, if both the transactions are just one after another it may be raise a red flag when analyzed in-depth. PrivCoin not only allows time-gaps, it provides 100% user control on it, which is rare considering how a very few numbers of Bitcoin mixers actually do so. 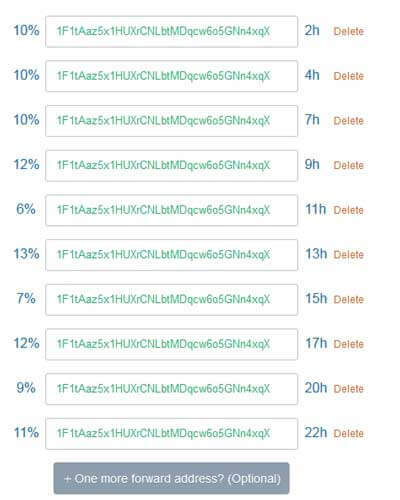 By 100% user-control I mean users not only get to specify a time-gap but they have the ability of specifying exactly how long the mixer would wait before sending every single transaction, for every single additional address! This delay is set using sliders, each address gets its own marker and the delay can be adjusted as well as is reflected in real-time just right to that address. Also, this gets users the knowledge of exactly when each address would be funded with the Bitcoins from the mix. Does PrivCoin Provide Distribution Control? Distribution Control implies the ability to control the amount of funds each individual address receives, not a feature many Bitcoin mixers offer, fortunately PrivCoin does. This distribution too can be controlled using sliders, again each individual address has its own marker on the slider which corresponds for each address. 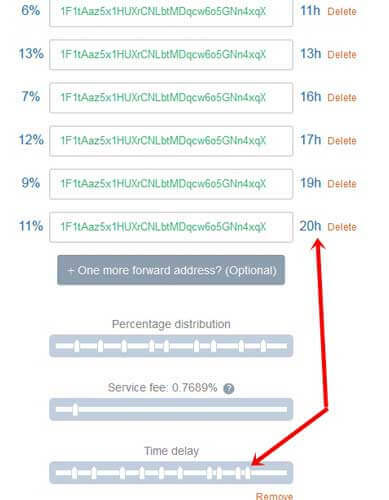 Unlike most other mixers which randomly specify amounts for each address, with distribution control you can send funds exactly as you want, maybe a major chunk to your primary address, and just deceptive, smaller amounts to other addresses? 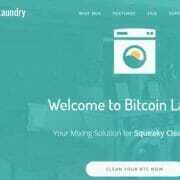 This adds to anonymity as explained earlier, the funds come out in parts, and hence no individual transaction equals the net amount sent in for cleaning hence further decreasing links between the set of unclean and clean coins. What Fee is Charged by PrivCoin? Fee is one of the major points for any platform review, and the same holds true for this PrivCoin review as well. 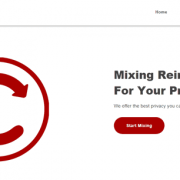 PrivCoin charges a 0.5% standard fee per mix which is at par with what other mixers in the industry are charging. It also has an additional 0.0005 BTC fee per additional address, there are mixers out there with cheaper, as well as more expensive fee/extra address depending on which mixer we’re talking about. The fee is user-controlled as well, meaning users get to increase the fee from the minimum limit, upto a maximum of 3.49% in order to randomize the fee for each transaction and make it further anonymous. What are the Minimum/Maximum Limits and Confirmations Required? PrivCoin has a minimum limit of 0.005 BTC, anything lower than this amount can’t be mixed. There however is no maximum limit and it depends on the mixer’s fund reserves at the time of mixing. The number of confirmations required too are dynamic, for amounts lower than 5 BTC it needs just 1 confirmation, 5-25 BTC need 3 confirmations, 25-50 BTC need 5 of them and finally 50 BTC+ need as many as 9 confirmations. Now for the Elephant in the room; the one question you’ve all been saying out loud in your brains since the very start of this PrivCoin review, does it store logs? Cause it may be super feature-rich, cheap, easy to use and everything else, but none of that would matter if it didn’t have an acceptable logs policy, right? Well, fortunately PrivCoin has a strict no logs policy with 24-hour retention period, meaning it keeps logs related to the transaction only for 24 hours in order to provide support and solve questions related to the mix. After 24 hours, all logs pertaining to the transaction are deleted permanently. So that’s me signing off this PrivCoin review folks. I believe I’ve discussed the user interface, time-delays, distribution control as well as the Fee and logs policy, which should cover just about everything a Bitcoin mixer comprises of. In my personal opinion, there aren’t any features which PrivCoin missed from its end. So yes it definitely is a mixer I think is worth a try. Although that’s just what I think, it may not necessarily be your verdict as well. 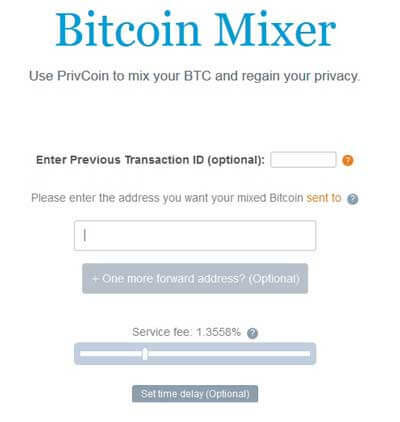 So do give it a try whenever you need to mix your coins next and let me know what you think of the mixer as well as this PrivCoin review in the comments down there.